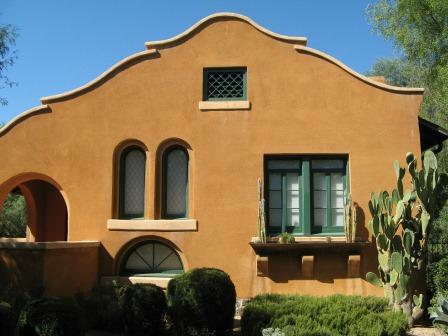 A historic Tucson home, known as the Cheyney House, is up for sale downtown (Update: this home is currently off market). This home was named after Annie Cheyney who had the home built in 1905 in the area that was then known as ‘snob hollow’. Annie was the widow of a mining chemist named George Washington Cheyney, who worked at the mines near Tombstone and served as one of the early postmasters of Tucson. The Cheyney House was designed by the architecture firm Holmes and Holmes. The Holmes brothers, David and Jesse were from St Louis. David moved to Tucson to teach at the Territorial University in 1898. Jesse joined him in 1905. 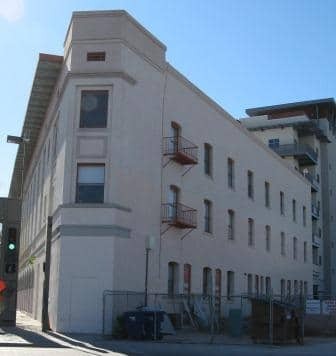 They worked on many buildings during their time in Tucson, including the MacArthur Building (1908) located on Toole in downtown. They designed the Cheyney House in a Mission Revival style featuring an asymmetrical pediment. The Cheyney House partially burned in 1981 and was in disrepair for almost 20 years. It was supposed to be demolished, but was instead purchased by Gerald and Emma Talen who restored the home in 2001 in accordance to National Historic Standards. Bob Vint, AIA worked on the extensive restoration. The home is listed on the National Register of Historic Places. It is currently divided into 2 apartments with 2 bedrooms each plus an 1176 sf guest house with an additional 2 bedrooms and one bath.